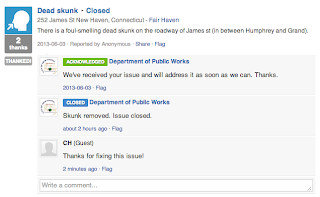 New Haven Civic Hack Day Roundup! We were proud to host Connecticut's sole National Day of Civic Hacking. With over two dozen awesome civic activists at SCF HQ, we had projects ranging from DataHaven, Bump Finder, Community Geo-Policing (aka SeeClickBust), all using parts of the SeeClickFix API. There was also some great support and followup both outside New Haven and online, including this blog post: Bettering Neighborhoods with R: Exploring and Analyzing SeeClickFix Data. For the rest of June, you can submit your project for review by the White House and other partners. 8 to 15 projects will be invited to attend an event at the White House at the end of July. We'll definitely be hosting a couple more of these in the near future, so be sure to stay tuned & find out more. BOSTON – Tuesday, June 18, 2013 – Secretary of Administration and Finance Glen Shor today joined officials from the City of Boston and local officials from participating municipalities to formally launch the Commonwealth Connect app used by 54 cities and towns across the Commonwealth. The smart phone application is based on the Citizens Connect app developed for use by the City of Boston and allows residents to report quality of life problems, such as graffiti and potholes, in real time directly to their local government for resolution. Since its early release in some communities in January 2013, over four thousand service requests have been submitted from 40 different participating cities and towns, over 1,300 issues have been reported by residents via the mobile app, and nearly 3,400 service requests have been completed. Already, over 2,400 people have downloaded the mobile app, which works on both iPhones and Android phones. Commonwealth Connect is made possible by a Community Innovation Challenge (CIC) Grant provided by the Patrick Administration awarded to the City of Boston. Launched in the FY12 budget and administered by the Executive Office for Administration and Finance, the CIC Grant program invests in innovations that have the potential to lower costs and improve critical services through regionalization, new uses of technology, and improved management practices. To use Commonwealth Connect, residents with smart phones download the app, snap a photo of a problem and submit it to their local government. The residents get a tracking number for their case and can see when their issue is resolved. Nearly half of the municipalities also use Commonwealth Connect as a feature on their website, making it easy for residents to report issues on-line as well. "Northampton residents quickly embraced this expanded citizen engagement tool," said Mayor of Northampton David Narkewicz. "The City of Northampton now is working towards integration of Commonwealth Connect with our work order management system, called VueWorks. 670 issues from Northampton residents have been submitted since the soft launch in January." Commonwealth Connect was developed in partnership between the City of Boston and its vendor SeeClickFix. Based in New Haven, CT, SeeClickFix is one of the pioneers of apps and services that allow residents to act on issues they see in their neighborhoods. Participating municipalities using the expanded application include Ayer, Barnstable, Bedford, Boston, Braintree, Brookfield, Chicopee, Chilmark, Clarksburg, Eastham, Easton, Everett, Fall River, Fitchburg, Framingham, Franklin, Halifax, Haverhill, Holliston, Hopkinton, Lexington, Malden, Medway, Melrose, Middleborough, Nantucket, Needham, New Bedford, Newton, North Adams, North Andover, Northampton, Orange, Randolph, Revere, Royalston, Seekonk, Somerville, Sudbury, Taunton, Wakefield, Ware, Watertown, West Boylston, Westborough, Whitman, Woburn, and Worcester. In addition, Commonwealth Connect is integrated with the systems of eight additional communities, bringing the total number of communities connected up to 54. Those communities include Andover, Boston, Chelsea, Lowell, Quincy, Saugus, Swampscott and Worcester. In the FY12 budget, Governor Patrick proposed the development of the CIC grant program to encourage and incentivize regionalization and other innovative efficiency initiatives. The CIC grant program was supported by the Legislature, providing $4 million for regionalization and other initiatives that will improve the effectiveness and efficiency in the delivery of local services. An additional $2.25 million in funding for the program was provided in the FY13 budget. Commonwealth Connect is a project of the Mayor’s Office of New Urban Mechanics: Mayor Menino’s Office of New Urban Mechanics focuses on piloting transformative services that leverage civic engagement and new technology. We've mentioned the Harsimus Cove and the awesomeness that is Stephen Musgrave before, but this takes it to another level. As a one-man army of 311 reporting, Stephen Musgrave has gone above and beyond reporting issues in Jersey City--logging over 300 reported issues and 1,000 comments. If that isn't impressive enough, back in March they put together an analysis on their use of SeeClickFix, the types of issues reported, and overall takeaways from the data. This is just one of the ways SeeClickFix can be used to go beyond simple reporting to help citizens and cities glean insights into their communities they never would have had before. By tracking each request from its initial report through the (hopeful) resolution process, a new picture is created of what problems a community faces and what successes the folks there have had. 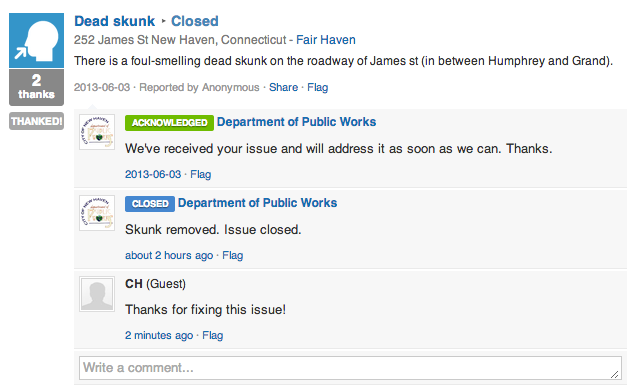 Eventually, we'd like to see the City work with SeeClickFix, putting me out of business as the "311 dispatcher." Gladly! While we don't want you to stop reporting, Stephen, we'd be thrilled to see that happen as well. SeeClickFix and Commonwealth Connect Issues Map! We're excited to be officially launching our full-fledged partnership with Commonwealth Connect today. While the exciting events happen, we wanted to share this awesome video we made showcasing real issues reported by citizens--including context for how events affect these reports. Download the app for iOS and Android now! We would like to take a moment to talk about some great May articles and shoutouts from across the country that focus on SeeClickFix in the community. Starting off this press roundup is an awesome SeeClickFix mention in PBS News Hour. One of our founders, Ben Berkowitz, was recognized as one of the 15 Young Go-Getters You'll Want to Meet! SeeClickFix was also mentioned in articles from across the country. These articles extolled its importance in encouraging engagement between residents and their local governments, and remarked on its assistance in creating increased levels of government accountability. Albany, which became a SeeClickFix partner in April 2013, launched it's AlbanyWorks4U application in May 2013. You can read about the application on these sites: Government Technology, Times Union, CBS06 Albany, and WAMC: Northeast Public Radio. The city of Vallejo's Public Works Department, a recent SeeClickFix partner, is hoping to release a more advanced version of the current mobile application within the next few months. You can read about the launch of the current application in the Times Herald here and here. An article published in the Everett Independent discusses the availability of the SeeClickFix/Commonwealth Connect mobile application in Everett, MA made possible through the Community Innovation Challenge Grant Program. Everett is one of the 40+ cities that will be a part of Commonwealth Connect. SeeClickFix had additional shoutouts in press from Houston, TX, Washington D.C. (you can read the articles in the Washington Post here and here), Hartsville, SC, and Macon, GA (you can read the press release from the Mayor here). Finally, SeeClickFix was mentioned in a column about Open Data and CityCamp Connect groups published in the News Observer. That concludes our May press roundup! Let us know if there's an article or shoutout that we missed. Is That a SeeClickFix Commercial? Just a little Friday fun: this short (30 second) video made by the good people in St. Charles, MO gives a quick overview of what SeeClickFix does in a creative way. This is a great surprise. If anyone wants to make their own SeeClickFix video, we'd be thrilled to chat about how we could make it mutually awesome! Thank You Public Servants and Municipal Employees! Today we're excited to launch a long overdue feature in the name of gratefulness. As of this post there have been 370,851 issues resolved by SeeClickFixers. 79% of issues reported in 2013 have already been fixed. All of these issues started in the open status, many were voted up and all were closed. But what about the all-important last step of saying thank you? We see follow-up comments giving thanks all the time and today is the day we programmatically formalize graciousness into the civic platform. On all closed and archived issues you will see that the status change button now reads "Say Thanks". Today I'm going to go back to a number of resolved issues in my neighborhood and click that button. At the end of the week the good folks who closed out the issues will receive the message--all of the 'thanks' they received from folks this week. While public employees deserve the bulk of the praise for issues resolved on SCF, I'm equally excited to thank neighbors who have jumped in and resolved issues in times of need as well. Please consider the thank you button as a feature a big thank you from the SCF Team to the SCF community. In case you missed it: this great article on GovTech talks all about the great things the City of Albany, NY is doing to prioritize technology, modernized services, and continued high quality government services to citizens of Albany. The city's openness to feedback is reflected by a new SeeClickFix application called AlbanyWorks4U. Like service trackers popping up in many cities across the country, the program uses GPS to recognize a reporting user’s location and provides a menu of common concerns from which to select. Users can upload pictures to accompany a report, and the application can be used for a variety of issues, such as graffiti, street maintenance, street light issues, damaged trees, parking meters and trash collection. Congrats, Albany, and we're proud to be in such good company.